Sovereign Funds back in business? The sovereign-wealth funds are stirring. After going quiet as markets crashed and some high-profile investments in U.S. financial companies went awry, the huge pools of capital are back doing deals. China Investment Corp. is planning a $500 million investment in Blackstone hedge funds and took part in Morgan Stanley’s recent rights issue. The Qatar Investment Authority is considering an investment in Porsche. And with the oil price back above $70, cash is flowing back into Middle East funds. The moves come at a time when significant new investments by SWFs — with between $2 trillion and $3 trillion under management according to the IMF — have been thin on the ground. Figures from Dealogic put the value of cross-border equity investments by SWFs so far this year at $21.1 billion. But that is flattered by the $12.5 billion conversion of Citigroup preferred shares held by Singapore’s GIC and the Kuwait Investment Authority into common stock. Last year, total investments were $46.9 billion, and they reached $55 billion in 2007. But as SWFs regain their risk appetites — no doubt helped by successful deals such as the recent profit Abu Dhabi’s International Petroleum Corp. recently made selling most of its $5.6 billion stake in Barclays Bank — they could be somewhat different investors. Some face serious criticism at home for losses made, especially on Western financial institutions during the crash. In China, for example, many wonder why CIC doesn’t spend its cash supporting the country’s own companies more. Those who have had dealings with CIC say it is likely to focus more on investing in resource sector and alternative energy companies. Abu Dhabi’s IPIC, after selling out of Barclays, says it is pursuing “hydrocarbon-related” opportunities. Singapore’s Temasek, meanwhile, already has been reorienting its portfolio more toward investments in Asia and Singapore itself. It seems probable funds will try to invest both closer to home, and in industries that fit more neatly with their own countries’ policy objectives. When they venture overseas, they are also likely to have learned from their mistakes and to be savvier in structuring deals. But as SWFs get more confident, foreign investments are likely to remain vital. First, capital constrained Western companies need deep-pocketed investors, so political opposition to SWF deals could be more muted than before. That is particularly true if funds are smarter in positioning their investments as strategic partnerships. In addition, despite protestations that some SWFs want to focus on Asian opportunities, or investments closer to home, there aren’t enough big opportunities to soak up all the cash. Large, liquid Western markets are likely to regain their allure. China Investment Corp. is poised to invest $500 million in a Blackstone Group hedge-fund unit as part of a broad effort to put cash to work while global markets are rallying but remain below earlier peaks. A hefty injection from China would be welcome news for hedge funds, eager to raise fresh capital after brutal markets and an exodus of investors hurt the industry. It also would offer another sign that some big money is stepping off the sidelines as markets stabilize world-wide. Companies and investors are watching to see if sovereign-wealth funds will once again channel significant money into new deals, after several were burned by high-profile U.S. investments during the financial crisis. Though Middle East funds have ratcheted up spending lately, some remain hobbled by woes at home. 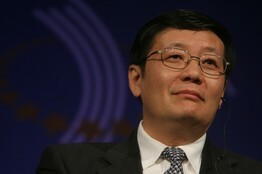 STEPPING UP: Lou Jiwei of China Investment Corp. sees opportunity. A spokeswoman for CIC and a spokesman for Blackstone declined to comment. Set up in 2007 and capitalized by Beijing, CIC is one of the world’s largest sovereign-wealth funds, controlling some $200 billion. The fund already knows Blackstone well, and has suffered some from the relationship. CIC invested $3 billion for a nearly 10% stake in Blackstone just before it went public in 2007, an investment that brought it ridicule in China when the private-equity firm’s shares fell. Since Blackstone’s IPO two years ago this coming Monday, Blackstone shares have dropped about 64%, leaving CIC with a loss of about $1.9 billion. Still, CIC managers later struck a deal with Blackstone allowing the fund to increase its stake to 12.5%, signaling confidence in the firm’s prospects. And committing capital to Blackstone’s hedge-fund unit is a bet more on its expertise than its stock. That Blackstone division has about $26 billion in investments doled out to hedge funds on behalf of Blackstone clients. One of the world’s largest so-called fund-of-fund managers, Blackstone commands access to some of the biggest funds. It isn’t clear how much CIC might allocate to hedge funds. In the past, CIC officials have said they plan to farm out up to $80 billion to asset managers, with private-equity firms and hedge funds likely to get a chunk of that capital. Prominent hedge funds have been talking to CIC for months. Eric Mindich of Eton Park Capital Management and John Paulson of Paulson & Co. are among hedge-fund bosses who have met with CIC representatives, among other Asian investors, in recent months, according to people familiar with the matter. Wall Street insiders see those hedge funds as on a relatively short list of managers more likely than peers to get CIC money, though such decisions could take months. Investment staffers at the Chinese fund also have sought the hedge-fund managers’ view of the credit crisis and global markets in general. Last year, James Simons, head of big hedge-fund firm Renaissance Technologies, talked with CIC about selling a stake in Renaissance but didn’t do a deal, people familiar with the matter said. Spokesmen for the hedge funds declined to comment. The China fund’s plans don’t necessarily mark a trend toward more global investments by sovereign-wealth funds. Temasek Holdings Pte. Ltd., Singapore’s state-owned investment firm, this year has moved to focus more on Asia investments, selling off stakes in foreign banks at big losses. In the Middle East, there has been continued deal activity. In March, Abu Dhabi investors snapped up a 9.1% stake in Daimler AG. And earlier this month, the government-backed investment company of Qatar said it is considering a deal to invest in Porsche Automobil Holding SE. The buying comes as the region’s fortunes have started to turn around, thanks in large measure to climbing oil prices. But some big Mideast players remain reined in. Kuwait, hobbled by political infighting and a banking crisis, withdrew from a planned joint venture with Dow Chemical Co. late last year, blaming the global financial crisis. And Dubai, another U.A.E. emirate, is still reeling from its property-market bust and lately has refrained from big international deal-making. CIC has been ramping up activity. CIC in late 2007 put $5.6 billion in Morgan Stanley convertible securities whose value later plunged. But earlier this month, CIC plowed an additional $1.2 billion into Morgan Stanley. On Tuesday, CIC struck its first known property deal, agreeing to commit 200 million Australian dollars (US$158.9 million) to a financing facility for Goodman Group, Australia’s largest industrial-property trust. Elsewhere, CIC put $3.2 billion toward a $4 billion fund managed by J.C. Flowers & Co. to hunt for opportunities among financial institutions.